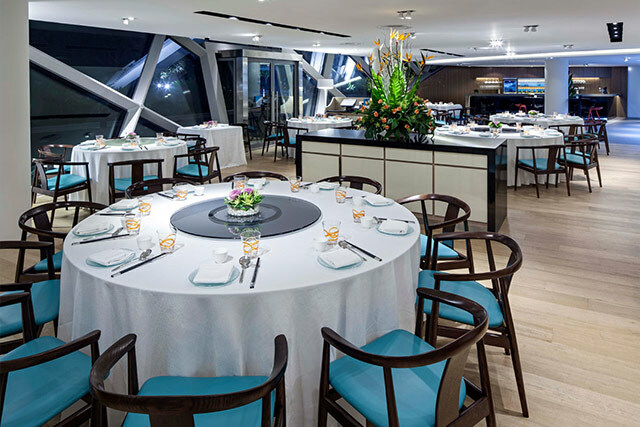 The design of the restaurant seeks to make the most of the impressive waterfront view of the Marina Bay, taking on nautical references in its design. The setting is reminiscent of a ship deck, with its modern palette of relaxing neutral tones, light oak floors, and a feature wall of round mirror ‘portholes’. The corporate colour of aquamarine further accentuates the ‘water’ theme. A live seafood tank at the entrance allows customers to select their catch of the day before it is freshly prepared for them. 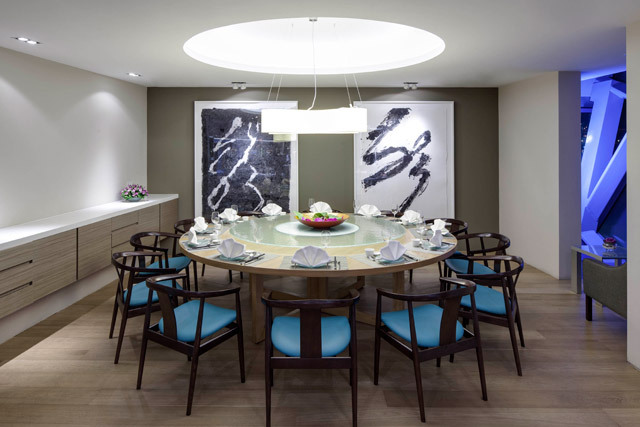 Noteworthy touches in the restaurant’s interior is the display of artworks by Hong Zhu An, an award-winning Singapore-based artist specializing in calligraphy on layered pigments. Exhibited around the world, his works layer paper pulp on rice paper to achieve a 3-D texture. The restaurant features four sought-after pieces from the famed artist—Scroll I and Scroll II, which upon close inspection reveal thousands of calligraphic characters from Buddhist sutras; and Dragon I and Dragon II, which demonstrate the dynamic strokes of the artist, and his subtle sense of style.